I have realized something about myself in the last little while that I am not such a fan of. I tend to be extremely critical sometimes. Often I am hyper critical about myself, and other times (these are the more frustrating times) I am critical of others. I have been working it – consciously working on it – for a while now. This past weekend, I spent a long weekend with my Mom and my 3 big sisters having a girls’ retreat. It was so much fun! I sometimes struggle with my personal criticisms when about to gather with them, because they are so good in many of the ways I struggle. I often go into those times feeling like I am so inferior to my sisters on so many fronts. I take it way past humility and deep into the realm of self doubt and hopelessness even. This weekend I was determined to just keep embracing who I am and not worry too much about what they would think of me, and I mostly succeeded. It was better than I have ever been able to do that before. I have already posted my new General Conference notes page for President Monson. Then I sat down today to prepare my lesson for next Sunday’s Sharing Time and realized it would be perfect for a handout, but with one easy addition. I added the phrase, “I am blessed when I choose to follow the Prophet!” Now I am super excited to act out the stories in the Sharing Time Outline and share my firm testimony of President Monson and encourage the kids to take their questions to Heavenly Father and then take the time to listen to the Prophet in General Conference for answers. Ohhh, I can’t wait for General Conference and I hope that I can help the kids feel the pricelessness of the opportunity to hear from the living prophets, seers, and revelators! I made all these fun activities for the Quorum of the Twelve last time, but I just used some of the things that are already available out there for the First Presidency. I will try to take the time to link up to all of those other GREAT activities next Sunday! Well, I decided that this time around, I wanted to make my own contribution to what is available to use during the First Presidency’s talks too! I just finished the first one – and it is of course about President Monson. I am a HUGE fan of allowing space for the kids to take notes (written for older ones or drawn for younger ones or even glued on pictures cut from old church magazines for even younger ones) during Conference – especially during President Monson’s talks. This fun little sheet has four “pieces of treasure” in which the kids can put their notes. The idea stemmed from Natalie Houston’s post on Sugardoodle. It was an idea she offered to go along with one of the March topics for Primary Sharing Time, but I am totally going to use the idea for a General Conference review session this time! I am so excited! Go check out her idea and you’ll see why I’m excited. 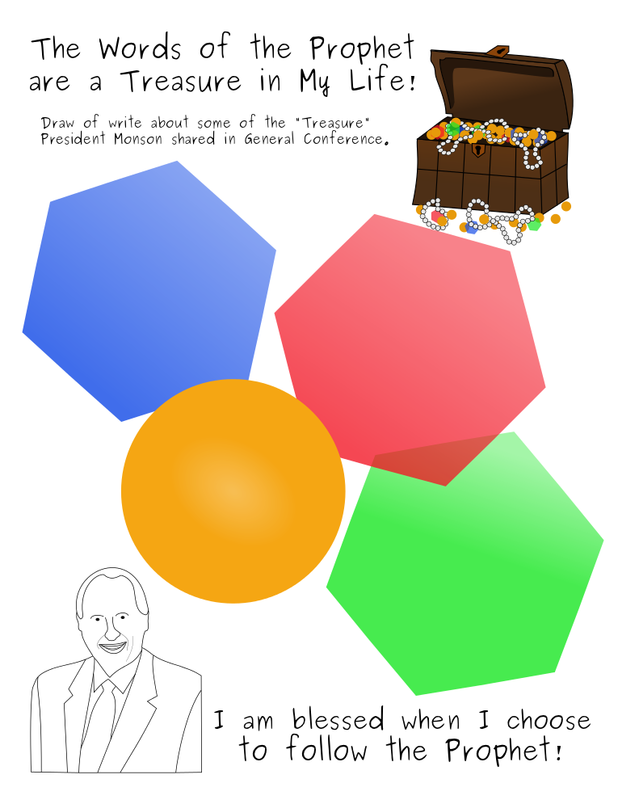 🙂 Anyway, after getting excited for this new idea for a post-Conference wrap-up, I decided to make my President Monson printable go along with the treasure theme. That way the kids can already be thinking in those therms before we ever start F.H.E. the day after Conference. Now I feel like I have taken that first step toward gearing up for Conference! Hooray! I can’t wait!! !